Between 1820 and 1990, the share of world income going to today's wealthy nations soared from twenty percent to almost seventy. Since then, that share has plummeted to where it was in 1900. As Richard Baldwin explains, this reversal of fortune reflects a new age of globalization that is drastically different from the old. In the 1800s, globalization leaped forward when steam power and international peace lowered the costs of moving goods across borders. This triggered a self-fueling cycle of industrial agglomeration and growth that propelled today's rich nations to dominance. That was the Great Divergence. 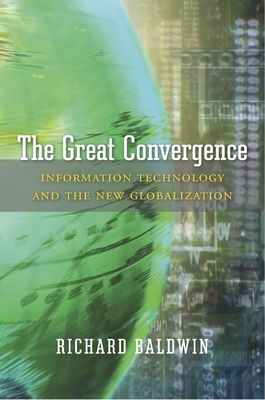 The new globalization is driven by information technology, which has radically reduced the cost of moving ideas across borders. This has made it practical for multinational firms to move labor-intensive work to developing nations. But to keep the whole manufacturing process in sync, the firms also shipped their marketing, managerial, and technical know-how abroad along with the offshored jobs. The new possibility of combining high tech with low wages propelled the rapid industrialization of a handful of developing nations, the simultaneous deindustrialization of developed nations, and a commodity supercycle that is only now petering out. The result is today's Great Convergence.